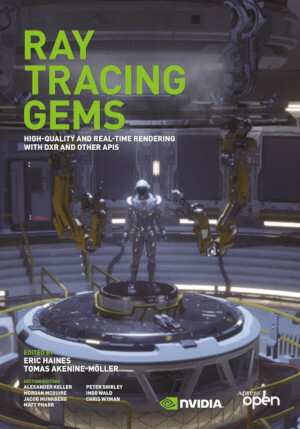 We're incredibly proud of our 3DMark team for contributing two chapters to Ray Tracing Gems — a new book full of advice and best practice from experts in the field. Ray Tracing Gems is a must-have reference for developers, students, and graphics enthusiasts looking for the key building blocks and latest techniques for implementing real-time ray tracing in games, applications, visualizations, and more. Our 3DMark development team contributed two chapters based on the techniques we used in 3DMark Port Royal, a real-time ray tracing benchmark that we released earlier this year. Indirect lighting, also known as global illumination, is a crucial effect in photorealistic images. While there are a number of effective global illumination techniques based on precomputation that work well with static scenes, including global illumination for scenes with dynamic lighting and dynamic geometry remains a challenging problem. In this chapter, we describe a real-time global illumination algorithm based on photon mapping that evaluates several bounces of indirect lighting without any precomputed data in scenes with both dynamic lighting and fully dynamic geometry. We explain both the pre- and post-processing steps required to achieve dynamic high-quality illumination within the limits of a realtime frame budget. We present an algorithm for perspective-correct, real-time specular illumination for surfaces of varying glossiness in dynamic environments. Our algorithm leverages properties from earlier techniques (e.g., radiance probes and screenspace reflections) while reducing the amount of visual errors by adding ray tracing to the rendering pipeline. Our algorithm extends previous work by allowing accurate reflections for all surfaces regardless of the material, and it has global coherence (i.e., there are no visible discontinuities). With radiance caching, multiple samples can be efficiently computed as the radiance computation is decoupled from the final shading. The radiance cache is also used to approximate the specular term for the roughest surfaces without any ray tracing. Ray Tracing Gems is available to download now for free.